It used to be quite difficult for the home consumer to purchase game meat, but things are starting to change. Although, you still can't simply walk into the local butcher and ask for wild boar; you now can readily find exotic meat available online. Marx Foods is a good online purveyor of quality meat, as they not only sell the typical game meat varieties, they also offer exotic options like alligator and kangaroo. Marx Foods also offers an assortment seafood, produce, cheese and pantry items. I recently had the chance to try their Game Meat Kit; a collection of venison, wild boar and duck. Being the boar lover that I am I decided to eat that first. The wild boar rack, included in the kit, is perfecting for roasting and can easily be sliced into chops once rested. 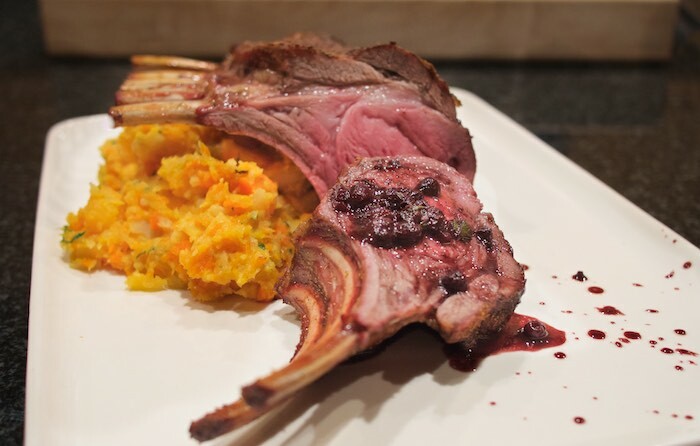 I served the boar with a fruity, almost earthy blueberry balsamic sauce, similar to the one Emeril Lagasse uses, and a side of mashed root vegetables. As with other products I've gotten from Marx Foods the quality and taste of the wild boar was superb. Set a 1-quart saucepan over medium heat and add 1 tablespoon of the olive oil. Once the oil is hot, add the shallots to the pan and saute for 30 seconds. Add the garlic and saute for an additional 30 seconds. Place the blueberries in the pan and cook, stirring often, for 2 minutes. Add the balsamic to the pan and bring to a boil. Continue to cook the balsamic until it is nearly completely reduced, about 3 minutes. Add the beef reduction to the pan and bring to a boil. Reduce heat, add the sage and simmer 5 minutes. Remove from the heat and add the butter, swirling the pan to dissolve. Set a pan over medium-high heat. Once the pan is hot, add the remaining 2 tablespoons of olive oil to the pan. Season the boar on both sides, with the salt and pepper, garlic powder and a generous coating of fennel pollen. Place the boar in the pan and sear on all sides. Place the rack in the oven and roast until the boar reaches an internal temperature of 145 degrees F on an instant-read thermometer. Remove the boar from the oven and serve with the blueberry sauce. That is an amazing meal! I have never tried wild boar, but I would love to. This sounds sooo good! I have always wanted try wild boar! This looks wonderful! A Game Meat Kit sounds amazing! Thomas would love that! Wow, that sounds awesome and I love that blueberry balsamic reduction! I've never tried boar, but I know my hubby has and he loves it! Oh wow! This looks so great! I've never had boar, but I want to! The blueberry with it sounds like a great idea! I've had wild boar a few times now. Delicious! I've also had wild boar in my back pasture.. If they come out in daylight hours, we'll be having a feast! Wow, what an impressive dinner! I never see wild boar on the menu unless I am in Goult, Provence where the boar run wild everywhere. This looks amazing, love the blueberry sauce, must be a great pairing.